If you are stopped in Alabama on suspicion of DUI, you may be asked to take a breath test roadside. (Note that officers must have reasonable suspicion, or probable cause, to make the initial DUI stop). A breath test measures the concentration of alcohol in your breath to estimate your BAC. A breath test that is administered roadside—before an arrest is made—is known as a Preliminary Alcohol Screening (PAS) test. The purpose of the PAS test is to help officers decide if there is probable cause to arrest you for DUI in Alabama. In addition, a preliminary breath test can be used as presumptive evidence in your drunk-driving trial. To take the test, you will be asked to blow into a portable breath analyzer (or “breathalyzer”), which will measure your blood alcohol content (BAC). In Alabama, it is a crime to drive with a blood alcohol concentration of 0.08 percent or higher. If the roadside breath test (PAS test) shows you to have a BAC at or above 0.08, you will certainly be arrested. Can you refuse a Alabama DUI PAS test? Unless you are under 21 or on parole, you have the right to refuse a roadside breath test in Alabama. It is 100% voluntary, and there are no penalties for refusing a roadside breath test; however, you could face administrative penalties for refusing the official breath test administered at the police station. Should you refuse a Alabama DUI breath test (PAS test)? › The roadside is not an ideal environment for conducting a breathalyzer or any other kind of test. › Breath analyzers themselves are unreliable and are calibrated to calculate blood alcohol content for an “average” person. To refute your breath test result in a DUI defense, an Alabama DUI lawyer can attempt to show that breath test is not calibrated for your specific body composition, and that the standard formulas for conversion from breath alcohol concentration to BAC don’t apply. Depending on the situation, evidence can be introduced showing that the suspect had recently been exposed to chemical compounds containing alcohol that increased breath alcohol concentration without raising the alcohol content in the bloodstream. It’s also possible to try to show that the breath sample was not handled correctly or the breathalyzer was not functioning properly. If you’ve been charged with DUI offense after submitting to a breath test, you may still be able to challenge the results of the test. 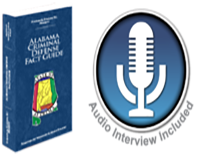 Speak to an Alabama DUI attorney about your charge by filling out the form below or calling 205.871.8838.